Palomid 529 (P529) inhibits both the mTORC1 and mTORC2 complexes, reduces phosphorylation of pAktS473, pGSK3βS9, and pS6 but no effect observed on pMAPK or pAktT308. Phase 1. (A) Cell growth rate fromP529 (2 μM) and vehicle treated MFN2 knockout MCF-7 (left) and A549 cells (right). (B) Representative pictures (left) and statistical analysis (right) shown colony formation from P529 and vehicle treated MFN2 knockout MCF-7 and A549 cells. (C,D) In vitro wound closure of P529 and vehicle treated MFN-2 knockout MCF-7 cells (C) and A549 cells (D) from 24 h after scratch assay. Sci Rep, 2017, 7:41718. Palomid 529 (P529) purchased from Selleck. After starved in serum-free medium for 24 h,A549 cells incubated with the indicated concentrations of Palomid529 for 3 h,followed by 20-minute stimolation of 100ng/ml EGF. Dr. Zhang of Tianjin Medical University. Palomid 529 (P529) purchased from Selleck. The proteins are produced with rabbit reticulocyte lysates. The amount of template used in each reaction is determined empirically and expression is monitored in parallel reactions where [35S]methionine is incorporated into the receptor followed by gel electrophoresis and exposure to film. 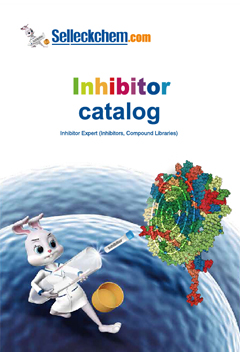 Binding reactions of the estrogen receptors (ER) and Palomid 529 are carried out in 100 mL final volumes in TEG buffer [10 mM Tris (pH 7.5), 1.5 mM EDTA, 10% glycerol]. In vitro transcribed-translated receptor (5 μL) is used in each binding reaction in the presence of 0.5 nM [3H]estradiol (E2). Palomid 529 is routinely tested from 10−11 to 10−6 M and diluted in ethanol. The reactions are incubated at 4 °C overnight and bound E2 is quantified by adding 200 mL dextran-coated charcoal. After a 15-minutes rotation at 4 °C, the tubes are centrifuged for 10 minutes and 150 mL of the supernatant are added to 5 mL scintillation mixture for determination of cpm by liquid scintillation counting. The maximum binding is determined by competing bound E2 with only the ethanol vehicle. Controls for background are included in each experiment using 5 mL unprogrammed rabbit reticulocyte lysate. This value, typically 10% to 15% of the maximal counts, is subtracted from all values. The data are plotted and Ki values are calculated. Experiments are conducted at least thrice in duplicate. Method: Human umbilical vascular endothelial cells (HUVEC) are used. The proliferation assay is carried out by seeding the HUVECs in 96-well plates at a density of 1,000 per well in complete medium. Following a 24-hour plating period, the cells are starved for 24 hours in 0.5% serum before being treated with Palomid 529 in the presence of 10 ng/mL basic fibroblast growth factor (bFGF) or VEGF in complete medium. After 48 hours, cell number is determined using a colorimetric method. The results are expressed as the percentage of the maximal bFGF or VEGF response in the absence of Palomid 529. Nonproliferating endothelial cells are assayed by growing HUVECs to quiescence in 96-well plates and treating with Palomid 529 for 48 hours. Initially, 5,000 cells per well are seeded and confluence is achieved the next day. The plates are incubated for another 24 hours to ensure growth arrest before treatment with Palomid 529. Xue Q, et al. Cancer Res, 2008, 68(22), 9551-9557. Diaz R, et al. Br J Cancer 2009, 100(6), 932-940. Lewis GP, et al. Invest Ophthalmol Vis Sci, 2009, 50(9), 4429-4435. Xiang T, et al. 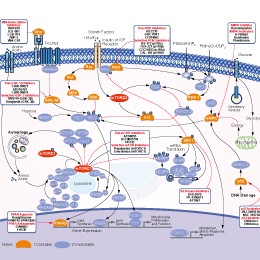 Oncogene, 2011, 30(21), 2443-2450. Gravina GL, et al. Endocr Relat Cancer, 2011, 18(4), 385-400.